Since the Chang'e-4 entered the lunar orbit on Dec. 12, the ground control center in Beijing has trimmed the probe's orbit twice and tested the communication link between the probe and the relay satellite Queqiao, or Magpie Bridge, which is operating in the halo orbit around the second Lagrangian (L2) point of the earth-moon system. Since the moon's revolution cycle is the same as its rotation cycle, the same side always faces Earth. The other face, most of which cannot be seen from Earth, is called the far side or "dark side" of the moon, not because it is dark, but because most of it is uncharted. The Chang'e-4 mission will be a key step in revealing the moon's mysterious side. China's Chang'e-4 probe has entered its planned orbit for the first-ever soft landing on the far side of the Moon. China’s National Space Administration said the control center will choose a proper time to land the probe. People have been admiring the Moon for thousands of years, but what's mysterious there are about to get a lot closer in a key step toward understanding the unknown far side of the Moon. The Chang'e-4 probe, which includes a lander and a rover, entered an elliptical lunar orbit at 8:55 a.m. Beijing Time on Sunday. 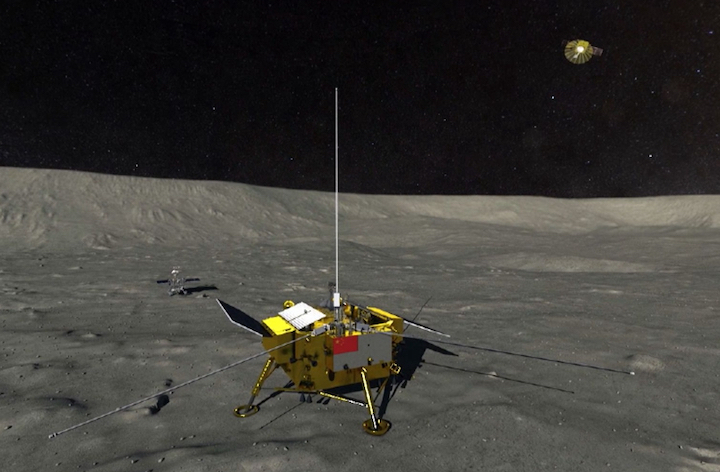 Over the next few days, the control center will choose the right time to land the probe on the far side of the Moon for the first time.Zou Yongliao, the director of the Lunar and Deep Space Exploration department at the Chinese Academy of Sciences, told CGTN that they plan to use the payloads on the lander and rover to obtain detection data such as topography, material composition and shallow structure of the landing area and the inspection area. This is key to understanding the geological history and evolution of that area. 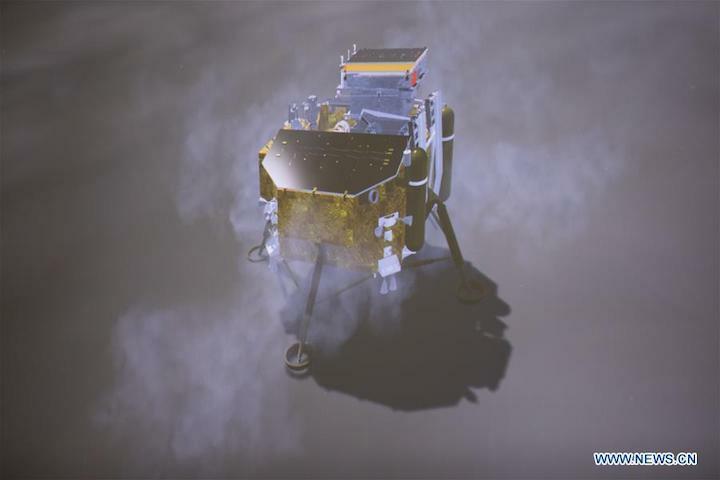 In addition to scientific programs developed by Chinese universities on the lander, there are also three international payloads on the rover, which were jointly developed by scientists from Germany, the Netherlands, Sweden and China. Zou said that they will try to study the duplex environment through these jointly developed international payloads. The duplex environment will include neutrons and neutral atoms. The Chang'e-4 was launched on December 8. 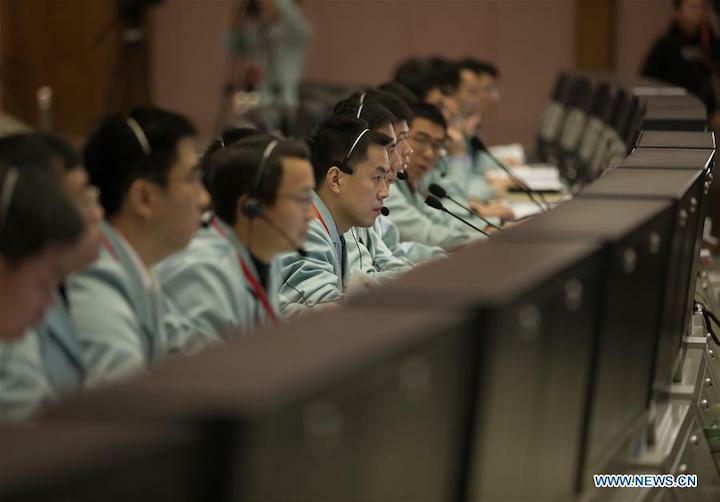 Since the probe entered lunar orbit on December 12, the ground control center in Beijing has trimmed the probe's orbit twice and tested the communication link between the probe and the relay satellite Queqiao. The space engineers also checked the imaging instruments and ranging detectors on the probe to prepare for the landing. 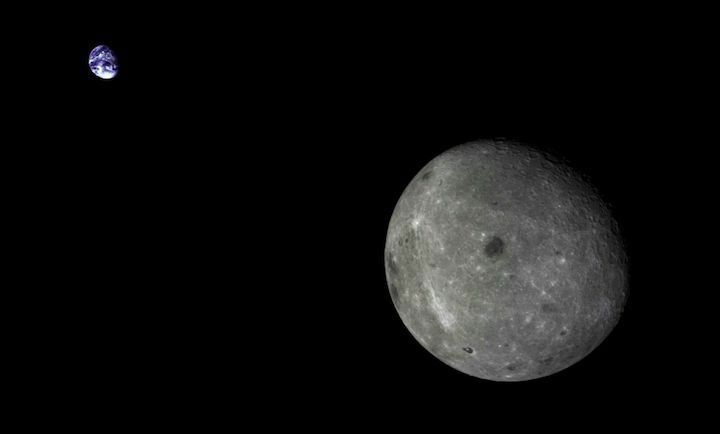 The Chang'e-4 lunar spacecraft lowered its orbit early on Sunday in preparation to attempt the first-ever landing on the far side of the Moon in the first days of the New Year. 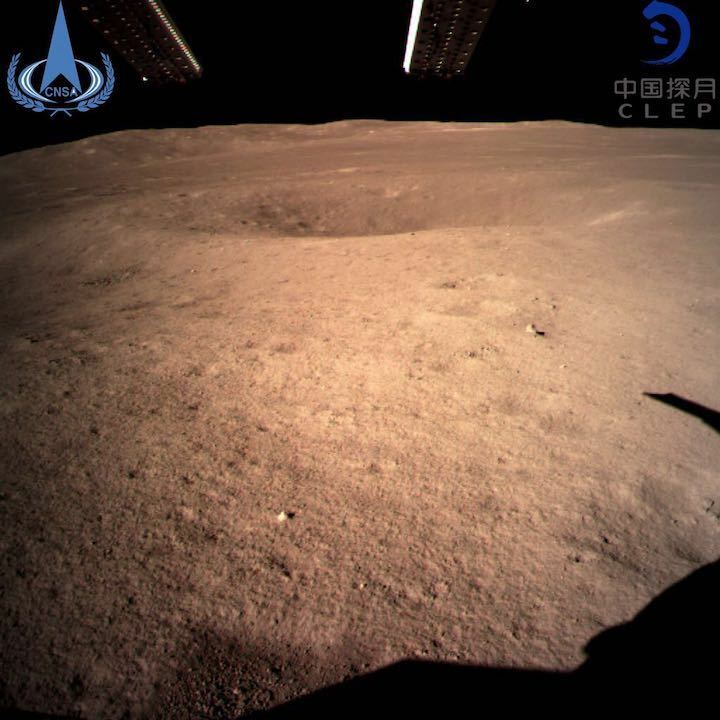 An official release by the China Lunar Exploration Project (CLEP) under the China National Space Administration (CNSA) on Sunday stated that the Beijing Aerospace Command and Control Centre (BACC) issued instructions to Chang'e-4, which then fired its at 00:54 UTC (08:54 Beijing time). Telemetry received by ground stations monitoring the mission confirmed by 00:56 UTC that Chang'e-4 had lowered its orbit from a circular 100 x 100 kilometre orbit to an elliptical 15 x 100 km orbit. CNSA stated said the control centre will choose a proper time to land the probe on the far side of the moon, with the landing expected to target a section of the Von Kármán crater. Chang'e-4, though carrying a small radioisotope thermoelectric generator (RTG) for limited lunar nighttime activity, will rely mainly on solar energy to power its operations. This means the landing will take place only after the Sun is deemed high enough in the sky over Von Kármán crater. 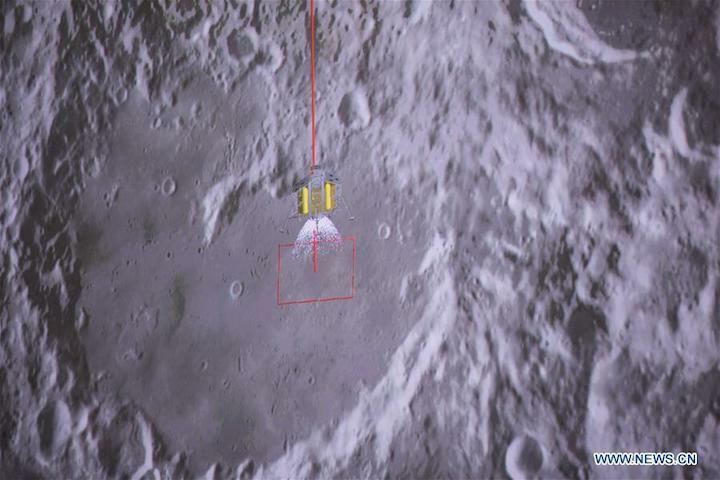 Since reaching the vicinity of the Moon on December 12, Chang'e-4 has refined its orbit a number of times, tested communications with the Queqiao ('Magpie bridge') relay satellite, and checked the imaging instruments and ranging detectors on the spacecraft in preparation for the landing. China's Chang'e-4 Probe Changes Orbit to Prepare for Moon Landing. China has been vague on the landing date, though early reports following launch suggested a date some 27 days later, equating to January 4 Beijing time. Scott Tilley, an amateur astronomer, has together with fellow tracking enthusiasts @DF2MZ and @uhf_satcom and with data assistance from Fabian P. Schmidt, been following the progress of Chang'e-4, providing clues to the activity and status of the mission in the absence of regular official updates from China. "We've been tracking CE4 since it arrived in lunar orbit on X-band [radio frequency]," Tilley says, noting that a burn was performed on December 26 to circularise the orbit of Chang'e-4. "Propagating estimated orbital parameters gives a first landing opportunity centred on January 2nd, 2019 at Von Kármán," Tilley said ahead of the Sunday orbital manoeuvre, with further updates to come following analysis of the orbital plane of Chang'e-4. Tilley offers the caveat that, "Given the fact the radio signal's nature is constantly modified by communication with Earth stations a more accurate estimate isn't really possible at this point." The mission is a repurposed backup to the Chang'e-3 spacecraft, which set down on Mare Imbrium in December 2013 and became the first spacecraft since Luna 24 in 1976 to soft-land on the Moon. Chang'e-4 entered a roughly 100 x 400 km altitude orbit upon lunar orbit insertion on December 12, following its launch from Xichang, southwest China on December 7. Queqiao has since June been in a halo orbit around the second Earth-Moon Lagrange point some 65,000-85,000 km beyond the Moon, ready to facilitate communications between the Chang'e-4 spacecraft and terrestrial tracking stations. The relay satellite, which features a 4.2 metre parabolic antenna, is required for a mission to the lunar far side as that hemisphere of the Moon never faces the Earth due to the phenomenon of tidal locking. The selected landing site is the 186-kilometre-diameter Von Kármán crater,which offers a relatively flat area within the South Pole-Aitken (SPA) basin, a huge and ancient impact structure which may contain exposed material from the lunar upper mantle and clues to the development and history of the Moon. 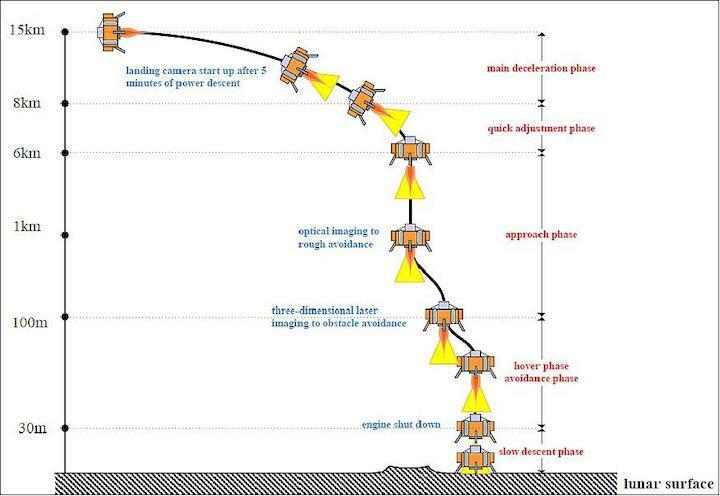 If landing is successful Von Kármán will offer the chance to analyse the variations of composition of the lunar surface and SPA melt sheet with the Visible and Near-Infrared Imaging Spectrometer (VNIS), while also returning unprecedented images with cameras on both the lander and rover. The Lunar Penetrating Radar (LPR) and low‐frequency radio spectrometer (LFS) payloads will also return unique data from the landing region and its subsurface, while the Lunar Lander Neutrons and Dosimetry (LND) instrument and Advanced Small Analyser for Neutrals (ASAN) will provide insight into the space environment and interactions with the surface. While the mission rover was due to be named in October following a public contest and vote, much like Yutu ('Jade Rabbit') for Chang'e-3, the name has not yet been revealed, leading to the rumour that a successful landing could see the rover named for Qian. Mankind's first explorer on the moon's far side soon will land on its destination, according to a schedule published by its developer. The Chang'e 4 robotic probe is expected to land on the South Pole–Aitken basin on the silver sphere's far side sometime between Wednesday and Thursday, according to information from China Aerospace Science and Technology Corp, a major contractor of the country's lunar exploration programs. Chang'e 4 was lifted atop a Long March 3B carrier rocket on Dec 8 at the Xichang Satellite Launch Center in Southwest China's Sichuan province to fulfill the world's first expedition on a lunar region that never faces the Earth. Tidal forces on Earth slow the moon's rotation to the point where the same side always faces Earth. The other side, most of which is never visible from Earth, is the far side of the moon. Though the far side has been extensively photographed by spacecraft, starting with a Soviet probe in 1959, no probe had ever made a soft-landing onto it, so scientists around the world have yet to be able to conduct close observations and surveys. The probe entered an elliptical lunar orbit, ranging from 15 kilometers to about 100 kilometers above the moon, on Sunday morning to make the final preparation for landing. 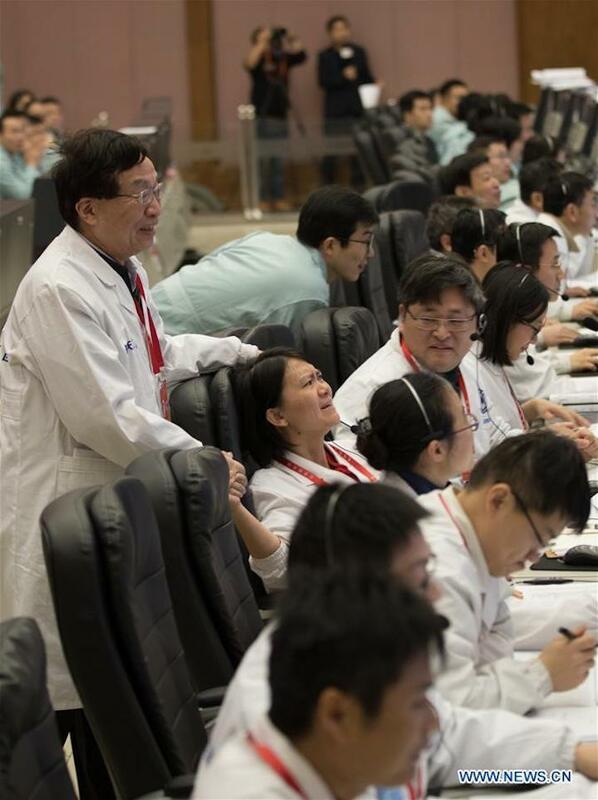 The Chang'e 4 mission will allow scientists to discover what they don't about the moon. They also can take advantage of the far side's shield against Earth's interference to make clearer observations into deep space, scientists involved in the program expect. Chang'e 4 consists of two parts – a lander and a rover, and the two carry multiple scientific instruments. It was designed based on its predecessor, the Chang'e 3, with some modifications. In addition to Chinese scientific equipment, the mission also involves scientific apparatus developed by the Netherlands, Sweden, Germany and Saudi Arabia. In May, China launched a relay satellite tasked with transmitting signals between Chang'e 4 and ground control. 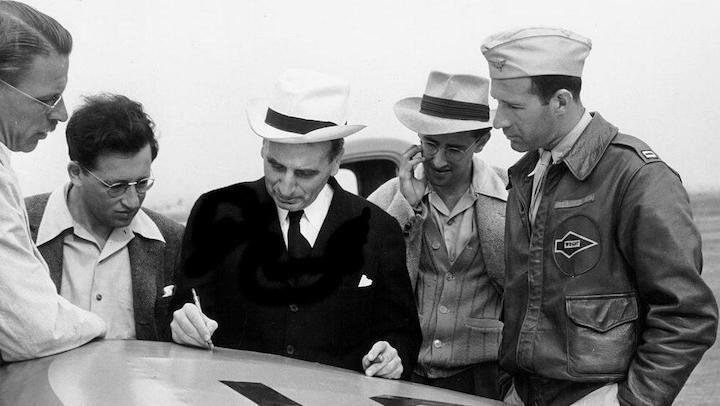 Theodore von Kármán, in the black coat, sketches out a plan on the wing of an airplane. After nearly a month’s travel, China’s spacecraft, Chang’e-4 is likely to land tomorrow (Jan. 3 local time) on the moon’s far side—something that no country has ever done before. It’s targeted landing spot is a crater named after Theodore von Kármán, a Hungarian-American aerodynamics pioneer who made significant contributions to America’s military and space advances in the 20th century. Von Kármán was among five Hungarian-origin scientists dubbed the “visitors from Mars” by Fritz Houtermans, a physicist who knew them in the 1930s, because of their extraordinary impact on physics and chemistry in the 20th century. The story of the group is also the story of how immigrants helped the US dominate science at a crucial time, Chemistry Nobel laureate Roald Hoffmann commented on a 2006 book about them, Martians of Science. After helping build a wind tunnel for the California Institute of Technology (Caltech), he was invited to be the first director of Caltech’s new Guggenheim Aeronautical Labs. In 1930, amid concerns about the rise of the Nazis in Europe, he accepted and moved to the US, becoming a citizen six years later. Von Kármán’s research helped the US develop the world’s most advanced air force, with the preparation of a prophetic 1946 report on the state of aeronautics, “Where We Stand,” that compared army technology among different countries, and envisioned advances such as supersonic combat aircraft and ballistic missiles. He put together a team to develop an experimental rocket testing facility that would become the Jet Propulsion Laboratory, which became part of NASA in 1958, and helped found the first commercial rocket-engine manufacturer in the US. Die chinesische „Chang'e 4“ setzte am frühen Donnerstagmorgen in der Nähe vom Südpol des Erdtrabanten auf. Humankind's lunar exploration history saw the opening of a new chapter on Thursday morning as the world's first explorer of the moon's far side landed at its destination after a 26-day space journey. The Chang'e 4 lunar probe, the latest step in China's endeavor to explore the silver sphere, landed at 10:26 on the Von Karman crater in the South Pole-Aitken basin and then sent back a picture of the landing site shot by one of the monitor cameras on the probe's lander, marking the world's first image taken on the moon's far side. 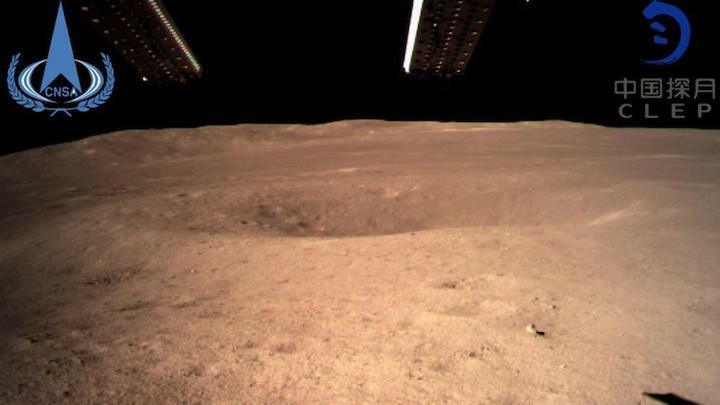 Photo provided by the China National Space Administration on Jan 3, 2019 shows the first image of the moon's far side taken by China's Chang'e-4 probe. The picture, published by the China National Space Administration, shows the place where Chang'e 4's rover will be heading to roam and survey. The successful landing formally inaugurated the world's first expedition to the far side that never faces the Earth and is expected to fulfill scientists' long-held aspiration to closely observe the enormous region. Tidal forces on Earth slow the moon's rotation to the point where the same side always faces Earth. The other side, most of which is never visible from Earth, is the far side of the moon. Though the far side has been extensively photographed by spacecraft, starting with a Soviet probe in 1959, no probe had ever made a soft landing onto it, so scientists around the world had not been able to conduct close observations and surveys of the region for decades. The probe conducted rapid position adjustments when it reached to an altitude 6 to 8 km above the moon. The descent then paused for a while at an altitude of about 100 meters as the spacecraft needed to detect and analyze the inclination as well as possible obstacles at its preset landing site so it could autonomously avoid hazards. Chang'e 4 was lifted atop a Long March 3B carrier rocket on Dec 8 at the Xichang Satellite Launch Center in southwestern China's Sichuan province. It consists of two parts – a lander and a rover, and the two carry eight mission instruments including two jointly designed by Chinese scientists and their counterparts in Sweden and Germany. With its investigation into the far side, particularly the Von Karman crater, the Chang'e 4 mission will enable scientists to discover what they haven't known about the moon and deepen their knowledge about the early histories of the satellite and the solar system. Researchers also can take advantage of the far side's shield against Earth's interference to make clearer observations into deep space, scientists involved in the program expect. Chang'e 4 is the fourth lunar probe China has launched since the country's lunar program was opened in 2004. Named after the goddess of the moon in Chinese legends, the first Chang'e spacecraft was launched in October 2007 to verify China's lunar probe technology, obtain lunar images and perform scientific surveys. The Chang'e 2 followed in October 2010 to carry out high-definition imaging of the moon and investigate landing conditions for the Chang'e 3. Chang'e 3, lifted in December 2013, was a milestone in the country's space exploration history because of its status as the first Chinese spacecraft to land on the moon and also the first man-made craft to touch down on the lunar surface in nearly four decades. Chang'e 3 released the first Chinese lunar rover, Yutu, on the moon. Yutu worked there for around 1,000 days.